What is your favorite (or strangest) face graphic? Thread: What is your favorite (or strangest) face graphic? Re: What is your favorite (or strangest) face graphic? Not certain, but I don't think either dial was originally produced by Vostok. I have one with gorby, everyone's favorite Russian leader. And not to say Russian/Soviet watches are alone with tacky portraits: I remember how I was shocked in 1978 (1st OPEC petrol shock) spotting in Geneva, at Bucherer’s window display, a platinum Rolly with then ruling Arab king’s portrait as dial background, black on gold, with a dozen diamonds for indexes. Believe me, poor taste has little borders, and nouveau-riche cross these no problem. Russ Cook and Chascomm like this. I don't have an example on hand, but I love the occasional Komandirskie that pop up sometimes on forums sporting a dial that commemorates some random factory. 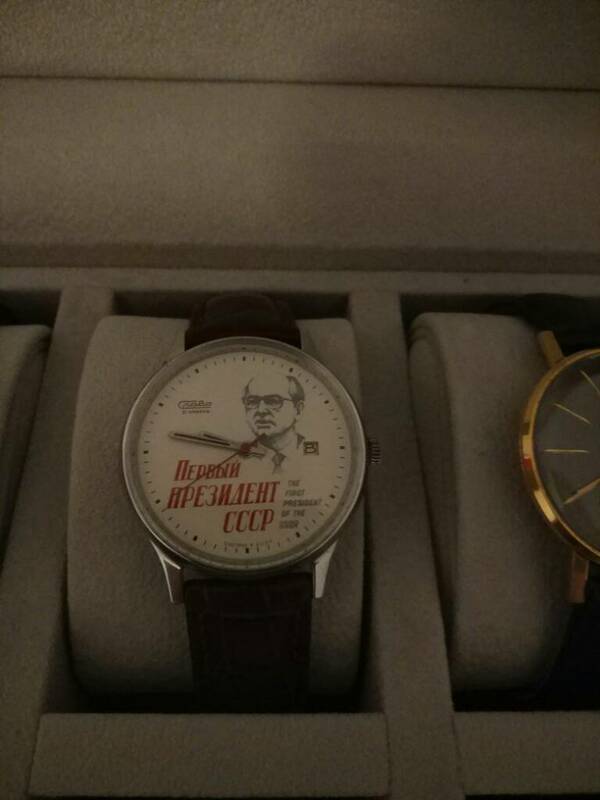 So you get people that scoop these up at a flea market for $5 and then proudly wear their watch commemorating the 40th anniversary of some factory making lampshades on Sakhalin. PanKorop, 24h, sertse and 1 others like this. Not my kind of watches though, but hey, everyone has got their preferences right? I'm not really a fan of watches with portraits of people on them. If we aren't just speaking about dials, what about this Sturmanskie with a Yuri Gagarin caseback? XsiOn, elsoldemayo, Chascomm and 1 others like this. What are your favorite Watch Faces? What Are Your Favorites by Price Category?